The culinary styles found on the islands of Hawaii are a delicious expression of the the region's rich and diverse culture and heritage, as well as a reflection of its exotic tropical location. Throughout history, immigrants have brought with them to the island their own recipes, ingredients, and methods of food preparation, some of which have fused together to create unique fare with a taste all its own. The cooks of Hawaii pride themselves on creating culinary masterpieces prepared with only the freshest ingredients, most of which are found locally, either growing amongst the islands' lush vegetation or caught from the surrounding ocean waters. The farmers and fishermen of the islands provide harvests of fresh seafoods like salmon, seaweed, and lobster, as well as tropical fruits and vegetables including plump tomatoes, savory herbs, lettuces, coconuts, pineapples, papaya and many more. Hawaiians also use a number of meats in their food preparation, particularly lamb, pork, and beef. The rich volcanic soils and well-stocked waters make the islands a cornucopia of delicious foods and fresh ingredients. Hawaiian cuisine embodies a variety of world cultures, and its regional foods include fusions of Euro-Asian, Pacific Rim, Indo-Pacific, and Euro-Pacific fare. When the Polynesians came to the Hawaiian Islands around 600 or 700 A.D., they brought with them many types of food ingredients that were not native to the islands. As the originators of Hawaii's culture, the Polynesians have had the most influence on the regional culinary style. Most Polynesian dishes are based on fruits and vegetables and thus naturally low in fat, a trait that characterized Hawaiian cuisine until the arrival of European settlers who brought pigs to the islands. Seafood is the staple of most meals, as the islanders relied on the ocean as their major source of sustenance. 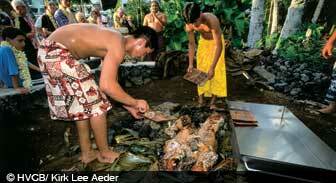 For celebratory events, Hawaiians often have big feasts called lu'aus. Bento is a compact boxed meal served throughout the islands of Hawaii. This picnic-type meal usually includes arranged sections of rice, pickled vegetables, and fried chicken, beef, or pork. Bento is also available in vegetarian-style, made with brown-rice. This quick meal originated from Japanese immigrants who worked in the pineapple and sugarcane fields, and were available everywhere, from department stores to corner delis and supermarkets. Plate lunches are similar to bentos in that they are a very casual meal. Plate lunches are purchased from lunch wagons, and made of fried mahimahi, "two scoops rice," macaroni salad, and a few leaves of green, which are usually julienned cabbage. The favorite condiment used for plate lunches is a thick gravy, and to wash it all down, a canned soda on the side. Along with delicious main courses, Hawaii also has its own signature beverages and desserts. There is so much variety when comes to dining in Hawaii that vacationers may feel overwhelmed when it comes to choosing a dish to sample during their stay. This article will prove an important resource for visitors who'd like to learn more about the culture found throughout Hawaii. Get more out of your vacation by taking the time to brush up on the history of Hawaii.